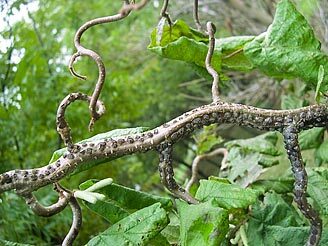 Eastern Filbert Blight, also known as EFB, is a fungal disease that is native to a wide area in eastern North America. Here it is found naturally associated with its host, our native American hazelnut (C. Americana), on which it causes only limited damage. However, EFB causes severe cankering, branch die-back and death of susceptible European hazelnuts (C. avellana). The primary limiting factor for growth of commercial European hazelnuts is EFB susceptibility. Attempts were made in the early 1900s to develop commercial hazelnuts for the eastern U.S. by hybridizing European and American Hazelnuts. However, success was limited due to a lack of understanding of EFB and the limited diversity of the genetic resources used in the breeding program. However, for nearly a century, European hazelnuts thrived in coastal Washington and Oregon, as the climate there was amenable and EFB was naturally absent. Unfortunately, this situation changed dramatically with the discovery of EFB in southwest Washington in the 1960s. EFB is now found throughout the Willamette Valley where it devastates susceptible orchards and its control adds considerable expense to production costs. Watch the spread of EFB that devastated susceptible hazelnut plants. The Hybrid Hazelnut Consortium is researching EFB to better understand the pathosystem. The development of hazelnut cultivars expressing durable resistance is necessary for long-term control of this disease across North America. Learn about our research plan about EFB and Hazelnuts.